Tall Walls - The Multipurpose Solution! Did you know that HMC offers many solutions to help divide your plant area? 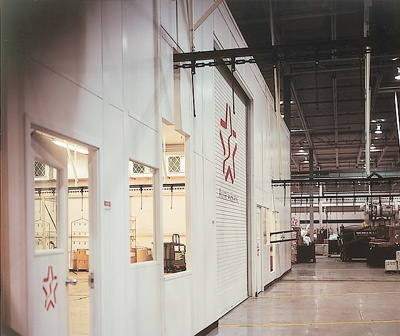 Whether you need to separate manufacturing from receiving or even create a floor to roof free standing in plant building, we have the systems that work. Take a look at how these walls can work for you! 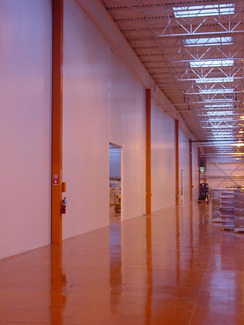 This steel system provides the flexibility for wall heights from 8' to 53' high. Panels range from 3" to 6" thick and are ideal fro walls that do not require many doors and windows. One benefit of this option is the ability to place doors and windows where you want once the material is on site. Installers simply cut doors and window frames into place. 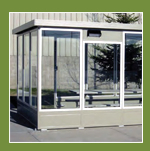 These full height one piece panels can be assembled in your plant in a fraction of the time of traditional construction. This system offers maximum flexibility and strength with a load bearing capability. The removable wiring studs allow for easy electrical install. 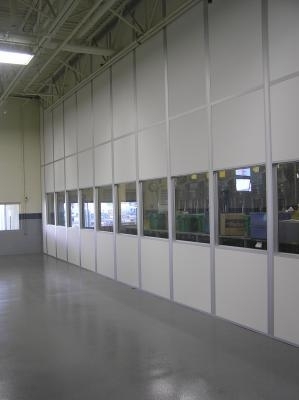 The framed system offers panels from 4-5/8" to 6" providing heights up to 35' high. Designed to connect to an overhead steel structure or freestanding with a roof deck, we can provide your plant with the controlled space it needs. As with everything we offer, the install time of this compared to traditional construction is a fraction of the time. See how easy it is to get started today!